Home / STORE / Asas Tomtebods / Tomte / Nisse. / Sophie. Sophie wears a red hooded cloak with her long hair cascading from her bonnet. What is a Tomte? Not many people have seen them because they are very shy and live in the woods. 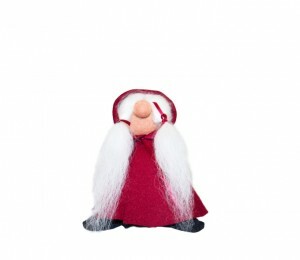 For those who have not seen Tomte I decided to reproduce them so everyone gets a chance to see them. Made from the felt and sheepskin of the icelandic sheep she stands 25cm high.